This linear floor clock features an open framed dial with Roman numerals and diamond shaped hands finished in an Antique Gold. The top, bottom, and back panel are finished in a complimenting Hampton Cherry. For a distinctively different appearance, the top and back panel can be removed. Requires (2) “C”-size batteries for Kieninger dual chime movement and (1) “D”-size battery for the pendulum swing mechanism (not included). The open case allows for the pendulum to be clearly viewed. The pendulum includes a bob that is finished in Antique Gold while the stick is finished in Aged Ironstone. The two unique decorative weights are square and finished in a complimenting Antique Gold. 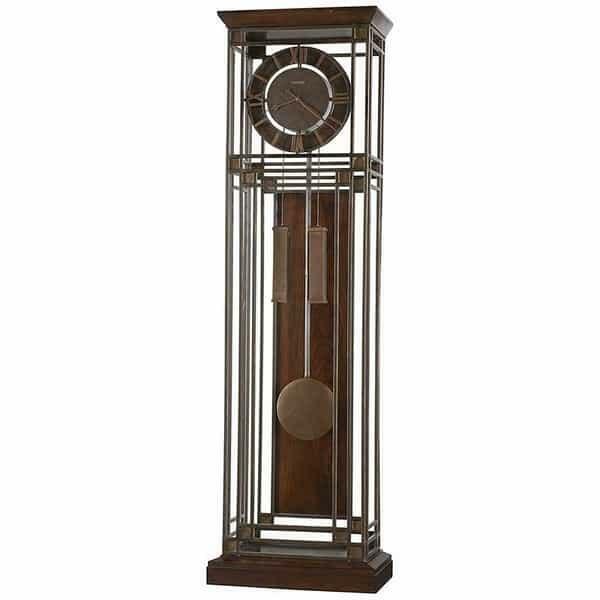 Quartz, dual chime movement plays Westminster or Beethoven chimes, and features volume control and automatic nighttime chime shut-off option. Finished in Aged Ironstone with burnished gold accents. Adjustable levelers under each corner provide stability on uneven and carpeted floors. Automatic nighttime chime shut-off option.